We’ve all heard the statistics and the science about soda being unhealthy because of its sugar content. Dentists have told us for years that the sugars and acids in soda are harmful to teeth, and should be consumed in moderation. But, for the first time in decades, soda is no longer the most popular drink in America. Naturally, as good parents, we turn to alternative beverages to help give our kids treats they will love while keeping their health as our top priority. Unfortunately, the alternative many people have chosen–fruit juice–can be just as harmful to teeth as sodas. 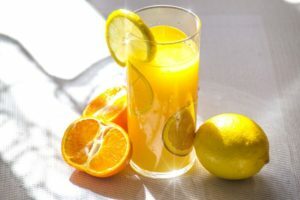 While there are many benefits to juices such as essential vitamins and minerals, there are downsides as well. The biggest issue is the buildup of acid that wears away at the enamel of your teeth. Teeth decay is caused by bacteria. Bacteria is always in our mouths, and we do our best to get rid of the harmful ones with brushing, mouthwash, and regular cleaning. However, bacteria thrive on the same stuff we do, namely sugar and other carbohydrates. When people consume lots of sugar, bacteria can thrive. Usually, this wouldn’t be a problem, except for the high concentrations of acid that we send towards our teeth. According to many dental experts, we are eating more acids now than even 10 years ago, and it doesn’t just have to do with soda. These acids weaken the enamel or protective layer of our teeth. Once they are weakened, the bacteria in our mouths attack the weak spots creating decay. Over time, this decay can grow into a cavity if we’re not careful with preventative dental care. Cavities can be treated with fillings, but the underlying cause remains the same. What Juices are High in Acidity? It is important to reduce the amount of acids that you consume. While you can still eat these foods, the following are very high in acid concentration. Ultimately, one of the best beverages you can drink is water. Water provides all the benefits of hydration without any negative impact on your teeth. While there are other drinks, such as milk, or specially made low acidity drinks, the sugar and acid combination is a one-two punch against oral health every time. Even sports drinks such as Gatorade or Powerade are too acidic and sugary for regular consumption. If you or your child are suffering from repeated cavities or are worried about your oral health, contact us at Hassey Do Duy Dental today. While we encourage all patients to get checked out twice a year, if you have extra questions or a situation where you need extra help, let us know and schedule an appointment today!